Finally, a time comes when you manage to free yourself from the shackles of monotony and puff out an extended sigh. But before you resume your normal breathing, what is that one portrait which captures your mindscape? For me, few important elements of that liberating picture are- the ‘Vroom’ of my motorcycles, ‘Click’ of my camera shutter and of course, the ethereal call of some unknown soil. This motorcycle diary dates back to 25th June, 2011. My only pony used to be a Bajaj Discover 125 back then. I wanted to ride along the beaches of Bengal which was demanding a complete week. Ouch, luck returned me a disdainful smile when my leave application got rejected at the climax of a much fantasized trip! Thus my well-planned twenty days vacation got truncated to a bad joke of three. But I refused to sit back and doze like a panda. Tall greeneries at two sides were real comfort to our eyes. As I Googled for places nearby Bardhaman, Indiamike travel forum came to my quick help. 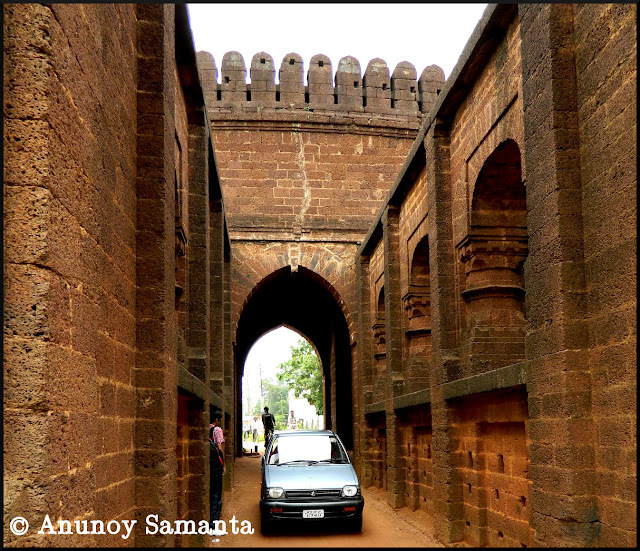 The old town of Bishnupur with its widely acclaimed terracotta architectures topped the destination shortlist. 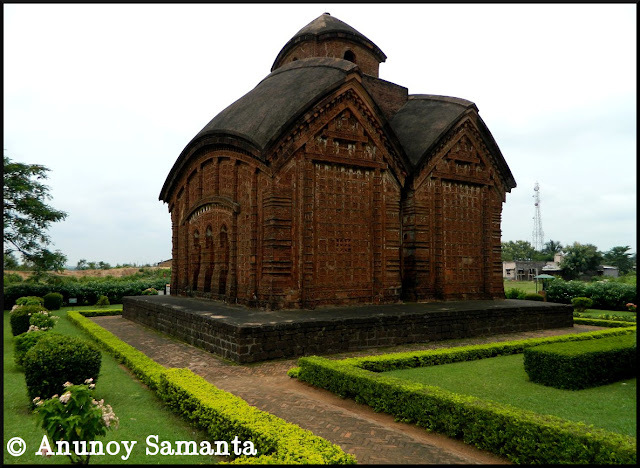 Bishnupur, renowned for its exquisite terracotta temples, illustrious terracotta crafts and the gorgeous Baluchari Sarees made of Tussar silk, is a town in Bankura district in the state of West Bengal. A quick web-search can fetch you a lot of information about the rich history of this temple town. Owing to its significance as a tourist destination it is nicely connected via roads to almost all major places of Bengal. There are regular and frequent bus services available between Kolkata and Bishnupur, which roughly takes 4-5 hours. This place is also connected by rail to the rest of India via Kharagpur and Bankura. 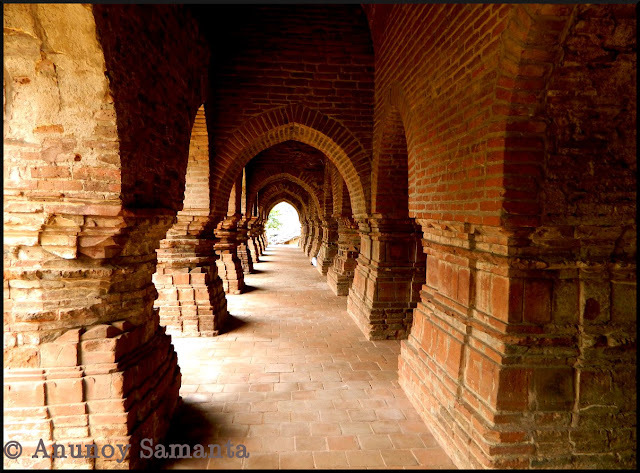 Once you reach Bishnupur, you better hire an auto-rickshaws or cycle-rickshaws, though I personally would prefer the later option due to its sluggish pace that enables your eyes to record the details of the town and its people better. 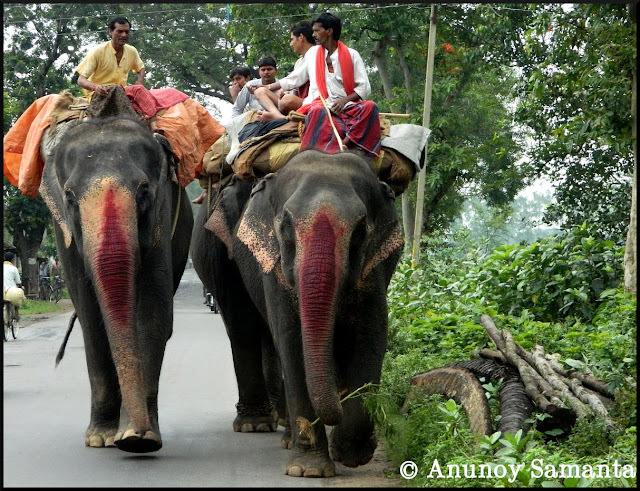 We came across a group of elephants near a place called Kotulpur. Luckily, my brother agreed to join me for the day ride to Bishnupur. As a routine ritual, last night I had packed my backpack before going to bed. The 4 AM alarm was anything but comforting. There was mild drizzle, so we couldn’t commence our ride before 05:45 AM. The sky was clouded and I could sense the pleasing collision of tiny drops of rain over my face and forearms. Unless you’re commuting for office, or an allergy-prone individual you love getting mildly wet… don’t you? We crossed Krishak Setu over the river Damodar and took the truck-congested Arambagh Road. We were never in hurry and kept mopping miles over the narrow yet nice state highway. What a bliss, there were no dust and smoke of big vehicles due to the wet atmosphere around us! What could be a better token of love from your lady luck when you are riding on a two-way road? 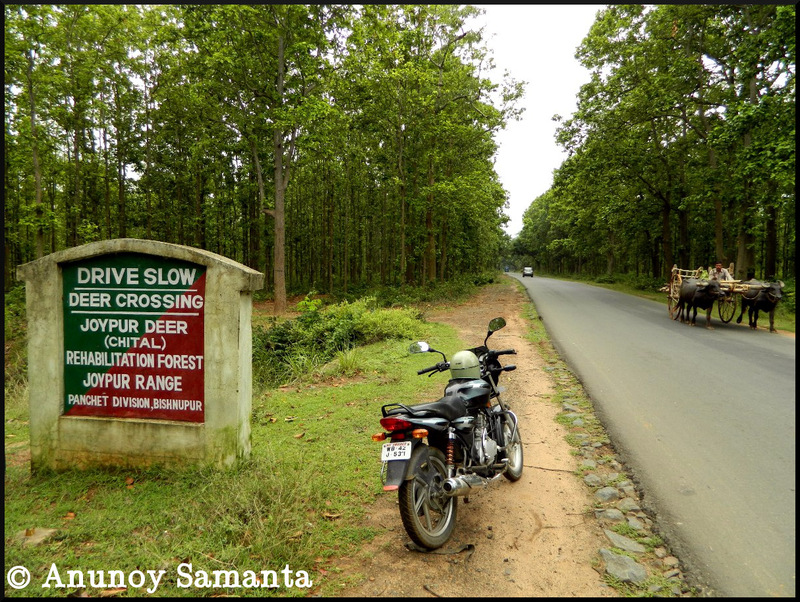 Soon we reached Arambagh, and it was time to take the diversion to Bankura-Bishnupur road. 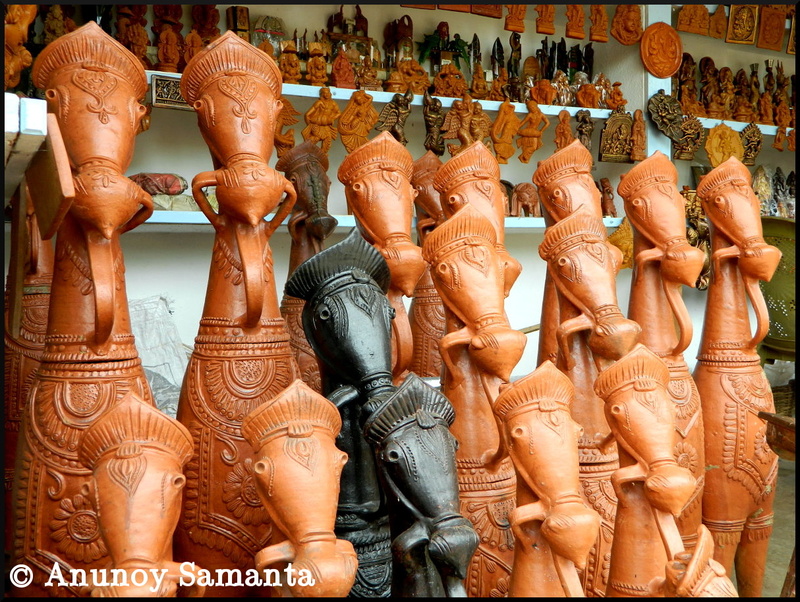 Bishnupur is renowned for its exquisite terracotta temples and illustrious terracotta crafts! Now it was the time for some woes as the road condition changed for bad. You can find a smooth span of 100-200 meters of tarmac, and suddenly a big trench (yea I really mean a trench)! The message is: be steady and watch out for ugly potholes. If you’re planning to drive your four-wheeler then you have to be twice slower, provided you love your machine. We came across a group of elephants near a place called Kotulpur. My brother spotted them first and showed me. I took out the camera and clicked few shots while passing by them gently. Our pony was no larger than a toy before those royal creatures. Due to some unknown reason, men riding those tuskers seemed displeased with my photography zeal. I couldn’t take the risk of annoying them and signaled my brother to speed up. Gradually we entered the forest road of Joypur. The road became butter smooth once again. Tall greeneries at two sides were real comfort to our eyes. Although the sun had come up the air was still cool. We came to know from a local guy that one can spot deer in the early morning on that road. We reached our destination by 09:30 AM. The trip-meter was showing a satisfying reading of “100” kilometers. I got down and inquired the directions of the places in my list. A veteran came to our aid. He was unexpectedly helpful and information rich. I listened to that nice man until he was satisfied with his guiding endeavor. 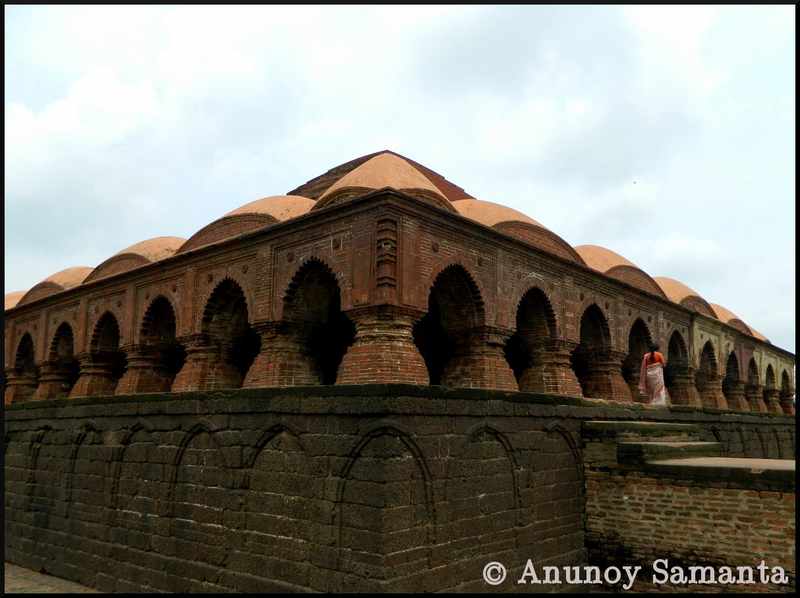 Then we covered different places of tourist interest at Bishnupur, one by one. Here I won’t elaborate each spot, because I believe, wanderers in general are not so thirsty for the background history. Rather they are more concerned with the visual appeal. Obviously I’m not talking of those serious group of travelers who don’t miss out any single chronology. Outside the Mrinmayee Temple we took double glasses of Lassi and came to know that tourists usually start gathering there from the Dussehra month. I was extremely happy to find the place almost tourist-free. In the entire trip we had to purchase tickets twice- once a Rs 5 ticket from Archaeological Survey of India for visiting three temples under their care (Jor Bangla temple, Temple of Shyamrai and Rasmancha), and another 5 rupees ticket for Lalgarh Nature Park. We covered thirteen places before the afternoon clock struck two. A couple of places were yet to be explored, like- a museum, Nutan Mahal etc. But we were left with no energy to push farther. Brother wanted to freshen up in a hotel to get rid of the dust and sweat over his skin. But I knew once we enter a hotel and take shower nothing would better cloud our decision than a cat nap which eventually shall delay our return ride indefinitely. So I swapped my cap with his helmet and zoomed out of Bishnupur. On reaching Joypur, we found a manageable roadside restaurant ‘Banalata Restaurant’, adjacent to a vehicle exhaust analysis center. There you can have your lunch in air-conditioned cabins by paying few extra bucks. Expect semi-decent Chinese and North Indian dishes, along with common Bengali cuisines. Pricing was OK. We had our lunch, sipped coke, and rode back to Bardhaman in a post lunch idle mood. Having munched 217 kilometers in the odo, we returned back to our place by 5 in the evening. I stopped by River Damodar to capture few quick snaps and conclude our road trip. As a bottom line note I must say, squeeze out some time, rekindle your traveling spree and head out for Bishnupur. You don’t have to plan anything in particular. You’ll be touched by the simplicity and down to earth nature of locals. 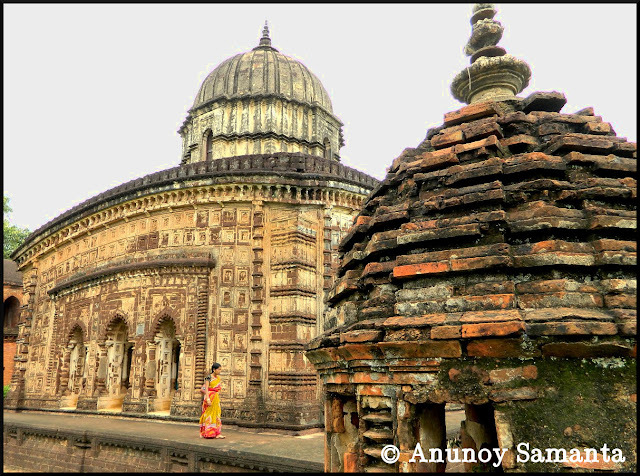 When you are at Bishnupur, every time you breath in, you urban conditioned soul will be rejuvenated by the relaxing aroma of rural Bengal. Finding an accommodation won’t be an issue. I would recommend a 2 days stay to make your trip more effortless and absorbing. - Check your tyre pressure periodically and maintain the optimum pressure as recommended by the manufacturer. Remember, slightly under-inflated tyres are safer than overinflated ones. - Avoid abrupt changing of lanes on a highway. Do so with proper turn indicator on. - Respect other drivers, riders and pedestrians on your way. - Engrave it in your mind that driving is a privilege, and by no means it is your right! 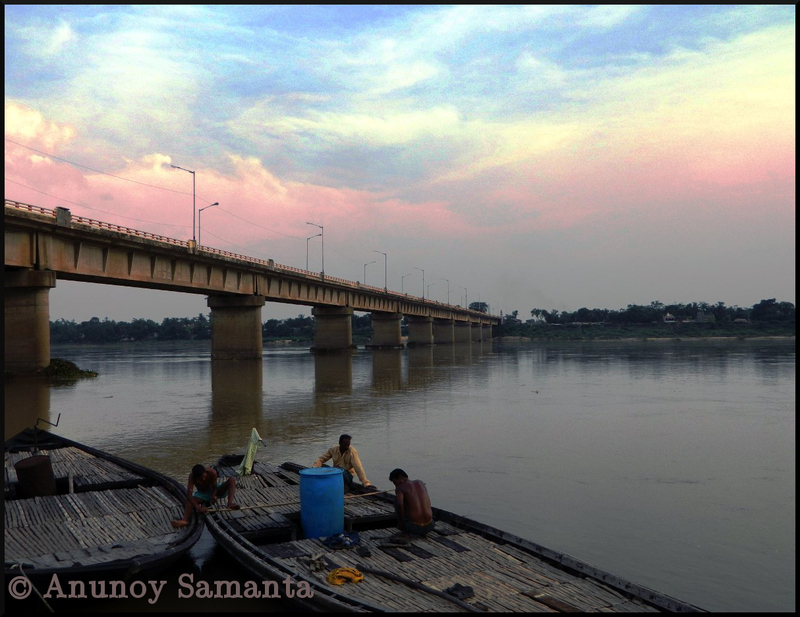 I stopped by River Damodar to capture few sunset snaps and conclude our road trip. "Kashmir of Koyalanchal", the name itself might be confidence inspiring for many travelers. But, if you are lured enough to visit Maithon anytime in summer be ready to confront its unforgiving warm weather. After all, coal belts of eastern India are meant to be hot, dusty and rough; aren't they? You must be wondering whether I belong to that elite group of high spirited wanderers who does not hesitate to accept challenges offered by extreme climatic conditions. Certainly I am not. Ladakh in winter does fascinate me, but not Jaisalmer in summer. So, why did I still choose to make a trip to Maithon in the ugly afternoon of 31st March? Those of you who know me personally or follow my blogs regularly are quite familiar with my status of being a solo traveler. Yes, solo traveling has its perks. But once in a blue moon when you get to take the highway and spend some quality time with your old school comrades then group traveling itself turns out to be boon! This time it was four of us. Few weeks back, we met in a cafe (not by any coincidence though). All four of us were desperate for a short road trip which necessarily would include a night halt. After few lazy permutations and combinations we agreed upon Maithon. 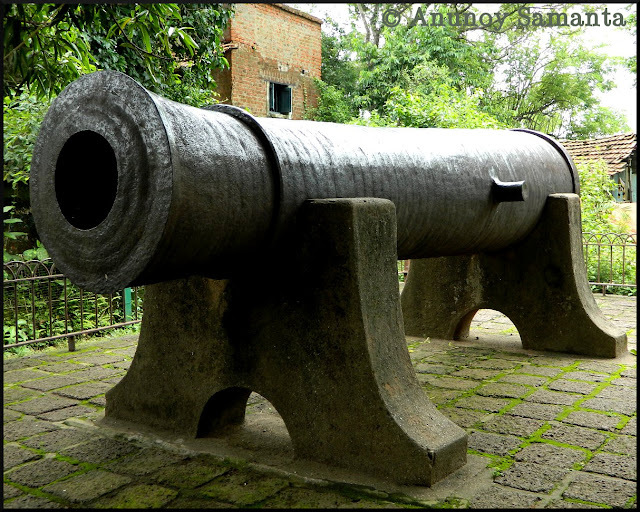 Maithon is barely 135 kilometers away from Bardhaman and the better part is, Maithon doesn't have many distractions to fatigue those visitors looking for an idle weekend stay. To top it all, I must admit, we cared very little whether our destination was Maithon or Madison. What kept us excited were the imposing thought of a journey together and of course, the anticipation of a blissful gentle-men's night out. Maithon is a small town located on Jharkhand - Bengal border, famous in the map of eastern India for its dam built on the river Barakar, which not only controls flood but also generates a huge amount of hydroelectricity. Maithon Dam is independent India's first dam project under Damodar Valley Corporation (DVC) which contributed immensely in turning the erstwhile wild river Damodar from "River of Sorrow" to a "River of Opportunities". Our subject of interest was bit off-center though. The mini travel plan was pretty simple- to reach Maithon by evening, find a comfortable stay, make every minute count in our exclusive style (because, one should make hay while the sun shines), wake up early, witness a mesmerizing sunrise from the dam-side (totally cliché I know), indulge in boating over the picturesque lake and commence our return journey with the usual, yet never-materializing consolation of planning another group trip very soon. None of us had a SUV/MUV, and hatchbacks we have couldn't provide us the space we needed. I wasn't ready to settle with a Mahindra vehicle but now I'm glad that I took a chance. The white Xylo we hired was sufficiently smooth and roomy. Other than our expected brouhaha the drive to Maithon was almost uneventful. I was overjoyed to discover complete absence of toll booth on NH-2, from Bardhaman to Maithon. Happy toll-free days won't last long as NHAI is setting up a toll plaza near Rajbandh. Although it was dark by the time we left highway and took the Barakar-Kalyaneswari Road, there was perceivable change in landscape. The surrounding was hilly which signaled us that we were not far from the "Kashmir of Koyalanchal". From the list of accommodation options provided in Wikitravel we decided to start our hunt from Hotel Shantinivas. Luckily the room was fine and the tariff was negotiable. We submitted ourselves to the hotel confinement and untied our inhibitions in search of Nirvana. For obvious reasons parting with the bed early was an onerous task, but the call of a rising sun over Maithon Dam was too shrill to ignore. We stepped out of the hotel only to discover an overcast morning sky. Somehow I wasn't disappointed. There were half a dozen of tea stalls outside. It'll be a gross understatement to call them tea-stall as you can find a wide variety of beverages, bread-omelette, puri-sabji and "what not? ", all under the same tin roof. You'll find auto-rickshaws eager to take you for a spin around the dam for 100 bucks or so. Avail them if you're not ready to walk 2-4 kilometers, or if you visit Maithon in odd hours of scorching noon. The boating dock was small, adjacent to a strategically located hotel run by DVC- Majumdar Niwas. Majumdar Niwas sits picturesquely on an isle, surrounded by green water and connected to the land by a long footbridge. I could only fantasize how ethereal it would be to spend a full moon night in that hotel! On the spot booking is not entertained there. So, you've to make prior reservation through DVC. Soon we reached the dam to explore the real essence of Maithon. Photography is strictly prohibited over the dam and there are enough security personnel to ensure that. Take a leisurely walk over the bridge. Although vehicles are not allowed to halt over the bridge, as a pedestrian you can take that leverage. Enjoy the vast turquoise (being overly poetic) reservoir at your left, studded with tiny islands of myriad shapes. Spot a distant fishing boat or try to figure out faraway rock forms. Just settle down, take deep breathes, curse DVC for their anti-photography policies, imagine how majestic the view would be during the monsoon time and start walking again to discover Jharkhand on the other end of the bridge. Oh hold on, do gaze at your left too, to find a herd of deer grazing undisturbed. We were back to the boating harbor, managed by Salanpur Panchayat Samiti. There are three options to choose from- speed boat, country boat and paddle boat. A friendly, tribal boatman took us for a hour long ride to Sabujdeep. Only a non-motorized country boat, sluggishly cutting through the emerald lake water could satisfy our boating appetite. We were in no hurry to reach. We wanted to smell the water and gulp its surrounding visuals with wide open eyes. A speedboat ferrying tourists went past our modest boat and the waves it created kept swaying us for a minute. Instead of feeling threatened we felt more pampered! The isle, Sabujdeep has certainly lost her chastity. Tourists have littered this once pristine piece of forest land with everything from liquor bottles to snacks wrappers. Otherwise, the local Pachayat authority has spent money generously in shaping this island tourist friendly. 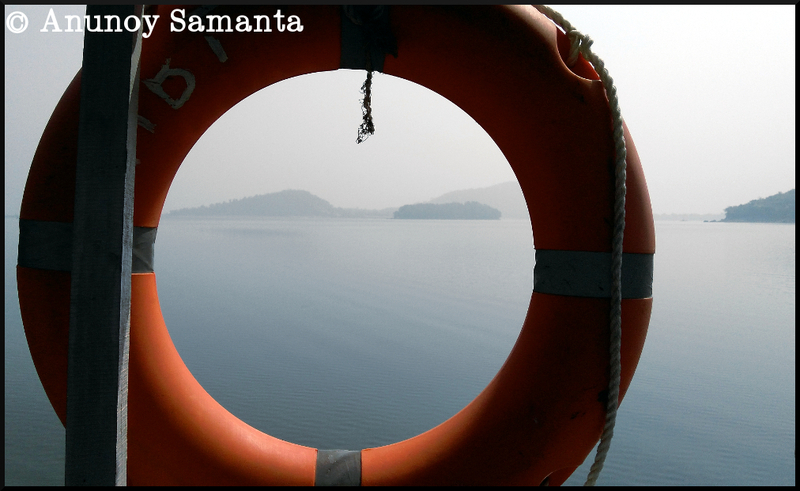 Occupy an umbrella shade at the extreme edge of Sabujdeep or hike the little hillock in front of the jetty to capture the best possible 360 degree panorama of the lake-scape. Good times get spent rocket fast. We had to check out of the hotel by 11:30. Our sole aim was unadulterated relaxation. But if you're visiting Maithon for the sake of exploring, do also visit the 500 years old Kalyaneshwari Temple and Pahari Baba Mandir. Owing to its close proximity to NH-2, Maithon is well connected to other places by road. Nearest railway station is Kumardubi, just 9 kilometers away. You have plenty of hotels and lodges to choose from. My half cent- visit this Kashmir of coal belt only in winter months. Safe traveling folks. Summer is on. Drink ample fluids and keep yourself adequately hydrated.